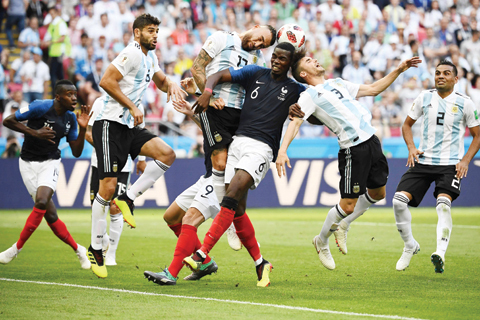 MOSCOW: France roared back against Argentina to reach the World Cup quarter-finals yesterday as wonderkid Kylian Mbappe sent Lionel Messi home empty-handed following a seven-goal thriller. The 1998 champions won 4-3 and looked a different side from the one that struggled to find their cutting edge in the group stage, pouring forward with pace and purpose to stretch the ageing Argentine defence in Kazan. Antoine Griezmann gave France the lead from the penalty spot but the South Americans levelled after a sweet hit from Angel Di Maria and edged ahead shortly after half-time through Gabriel Mercado. But defender Benjamin Pavard equalised with a thunderous strike to pull France level and once more change the complexion of the game. That set the scene for 19-year-old Mbappe, who netted two goals in four second-half minutes to become the first teenager to score at least twice in a World Cup match since Pele in 1958. Sergio Aguero gave Argentina late hope but they ran out of time and head home after a rollercoaster ride in Russia that ultimately ends in bitter disappointment for the two-times former champions. Man-of-the-match Mbappe brushed off the Pele comparisons. “I’m very happy and it’s flattering to be the second teenager (to score twice in the knock-out rounds) after Pele but let’s put things in context: Pele is in another category, but it’s good to be among these people,” he said. Beaten finalists four years ago, Argentina only reached the last 16 by the skin of their teeth after a shambolic group phase and despite a brave effort against France, their ageing squad and lack of balance ultimately caught up with them. Messi, at the age of 31, may have played his last World Cup game in a career curiously unfulfilled at international level despite his astonishing achievements with Barcelona and his multiple individual awards. France will play either Uruguay or Portugal in the last eight. Cristiano Ronaldo-with his eternal rival Messi now out of the way-will be looking to further burnish his reputation against Uruguay in Sochi. Ronaldo tore out of the blocks in Russia, smashing a hat-trick in his first game against Spain and he added another goal in the 1-0 win against Morocco. But Portugal’s problem against a Uruguay team with the meanest defence of the tournament could be their over-reliance on the 33-year-old five-time world player of the year. “We have to play as a team. If Ronaldo plays alone we will lose,” Portugal coach Fernando Santos said. Uruguay won the last of their two World Cups in 1950 but they have high hopes thanks to their stingy defence and two of the world’s most prolific strikers, Edinson Cavani and Luis Suarez. FIFA have declared the video assistant referee system, introduced to the World Cup finals for the first time in Russia, a success. Pierluigi Collina, the chairman of FIFA’s referees committee, said he was pleased with the impact of VAR but that it did not mean all decisions would be perfect.